PB. message stamp "For the Stars"
WOW GORGEOUS and simply ELEGANT!!! A beautiful card - the butterflies and colours are lovely. This is a really pretty card. I love the butterfly mask in the background and the colors you chose. Lovely! 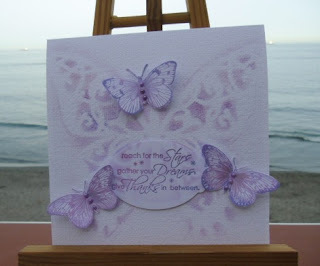 Such a lovely card for your grand daughter, I love the shaded butterfly background, and this colour scheme is beautiful.